I was delighted to get an invitation to this double bill of remarkably contrasting performances, which forms part of this year’s Physical Fest and which had Unity buzzing with atmosphere. Oog, is a solo performance by Al Seed, which has been touring since its emergence in Glasgow in 2014. 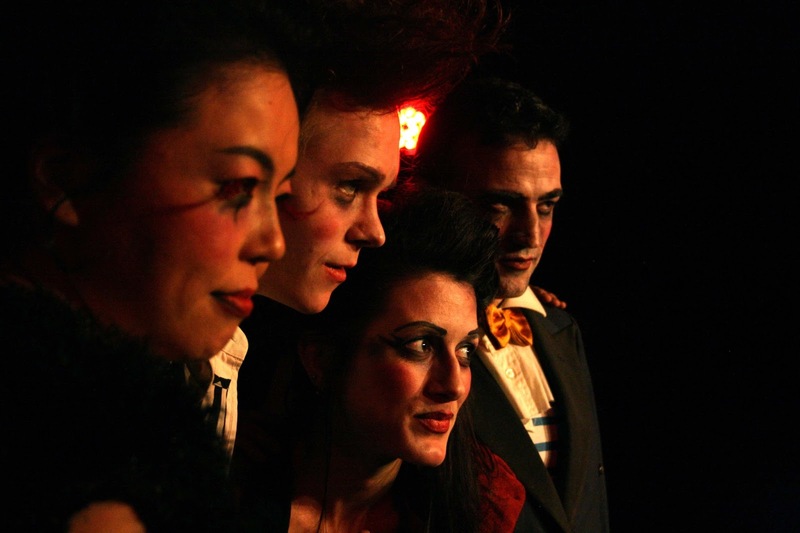 Cabaret from the Shadows is a locally-grown piece, developed at the Lantern theatre by Liverpool based but multi-national Teatro Pomodoro. For Oog we enter to find a hunched, seated figure onstage, completely obscured by the folds of a mud and blood soaked army great-coat. Under a focused shaft of light, he begins to move by gradual increments, his dirt-caked face emerging tentatively from the upturned collar like a frightened tortoise hiding in its shell. Here is a shell-shocked soldier, cowering in a subterranean world from which there seems to be a way of escape that he is too frightened to attempt. 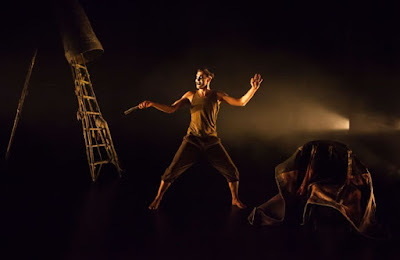 Al Seed animates his character with meticulous precision, every movement minutely synchronised to a pulsing, desolate soundtrack from Guy Veale, which appears to turn every breath and heartbeat into a terrifying memory of shell-fire and bloodshed. This is one of those “had to be there” pieces that pretty much defies analysis, but is powerful and finely crafted physical theatre that leaves its audience simultaneously stunned and elated. Opening, closing and interspersed by company musical cabaret numbers, there are some ideas here that seem to come from nowhere. Leebo Luby is a guitar playing chicken, continually taunted by Carmen Arquelladas who keeps carelessly smashing the eggs he lays. Miwa Nagai allows herself to be painted by a member of the audience, while Simone Tani becomes, among other characters, a risqué dancing Christ and a life-size voodoo doll, tortured for the sins of someone’s work colleague. The entire cast play a variety of instruments, but it’s Duncan Cameron who must clock up the most, acting as a kind of half-crazed emcee and carrying the weight of the musical input. He also finds a very unusual way of playing a harmonica whilst wearing a straightjacket – you’ll just have to try and imagine that. Cameron keeps challenging the audience to tell him whether they’ve gone a bit too far maybe a bit too soon in the evening, but this self-censorship just adds to the irony with which they dip their mischievous comedic toes into so many political subjects that theatrical productions seem unable to avoid allusion to. This was a one-night-only folks, but watch out for Al Seed’s Oog and Cabaret from the Shadows, because as sure as night follows day they’re bound to be back.